Ontology Mapping is one of the pillars of an ontology management system. The mapping component is used to link different ontologies having an overlap in their domain description. The mapping tool will enable the communication process between these shared representations that ontologies are. This task consists of linking the different entities of the overlapping ontologies and to model these links as axioms in the ontology representation language. We will in the following of this document what a complete ontology mapping tool should provide as functionalities. The Ontology management suite is composed of different parts that form a complete ontology management system. The ontology mapping module interacts with these different parts, giving some first requirements to its design. The ontology mapping module communicates with the ontology editor. The mappings that are realized between ontologies are implying the edition of these ontologies in order to visualize them and decide which entities (concepts, attributes, instances) have to be related. A strong coupling with the ontology editor is then necessary for this visualization to be effective. We may there envisage two possible realization. in the first case, the mappings functionality may be an embedded feature of the ontology editor. In that case, the user may realize mappings by opening different ontologies in different windows. In the second case, mapping editor is a separate component that invoques some features of the ontology editor in order to display the concept tree of the ontologies to be related. For more informations about the ontology editor, please have a look to the working drafts D8.X on this page. 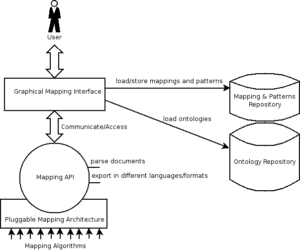 The ontology mapping module communicates with the ontology repository. In order to realize the mappings, the user should first be able to open the ontologies to be mapped. These ontologies are stored in an ontology repository which is part of the Ontology Management System (OMS). The ontology mapping module should then be able to communicate with the ontology repository, to retrieve the stored ontologies that will be used to create the mappings. The same happen when the user open a previously stored mapping (see next point), the mapping module should automatically retrieve the ontologies associated with this module and open them using the editor. For more informations, please have a look to the ontology repository fact sheet on this page. The ontology mapping module communicates with the ontology versionning support module. Ontologies are dynamic objects that evolve over time as the domain they conceptualize evolves. The versionning module is taking care of keeping the trace of this evolution. On a conceptual level, it may be considered that two slightly different ontologies and an ontology on which the user has performed small changes are very similar. In other words the changes made to an ontology may be represented as a mapping between an ontology and itself. For more informations about the ontology versionning support, please have a look to the working drafts D6.X on this page. An important feature of the DOME mediation component will be the reusability of the mappings generated by the users in other tools (reasonner, semantic web services builder, etc). In that purpose, we add as a requirement the commitment to an abstract mapping representation language, independent with the ontology language. These mappings will of course have to be grounded at the run-time to the language of the ontologies they are dealing with. The research in the mediation field is mainly concentrated on the automation of the mapping task. This research is active and involve different areas like graph theory or computational linguistics. As a result new algorithm realizing automatic or semi-automatic ontology mappings are continuously proposed. To get the advantage of these new algorithms, the DOME mapping tool needs an architecture that permits to plug the automation algorithms and select an appropriate one for a specific mapping task. In this section we elaborate some the requirements of the DOME mapping tool related with the functionalities we will offer. As specified in the last requirement, we impose the use of an abstract mapping language. From this language and a study of the mappings that are recurrently created by the user, we propose a library of mapping patterns. This library helps the user to select the appropriate mapping and then considerably reduce the time spent on the mapping task. The time spent on the mapping task will also be reduced by using automatic or semi-automatic ontology mapping algorithms, we also consider to present to the user a graphical mapping interface with the schemas of the ontologies to be mapped. We will now describe these fuctionalities in more details. The core of the mapping tool is the abstract mapping language. It gives a format to represent the mappings at an abstract level, independant from the ontology language used. We will in the following try to give a list of requirements[De Bruijn and Polleres 2004] that such a language must fulfill to be efficient. Mapping on the semantic web Our goal is to devellop a mapping language for the semantic web. As different ontologies representation language are in use in the semantic web, the W3C standard Ontology Web Language (OWL) [Patel-Schneider et al 2004] or the Web Rule Language (WRL) [de Bruijn et al 2005] to cite only thoses. The semantic web mapping language must give the possibility to realize mapping between ontologies written in these languages. For this we propose the use of an abstract mapping language ontology-language independent that may be grounded to different ontology languages depending on the needs of the user. A structural transformation is a change in the structure of an instance. This means that an instance might be split into two instances, two instances mught be merged into one, properties might be transformed to instances, etc. For example an instance of the concept PdD-Student in one ontology might need to ber split into two instances, one of Student and one of Researcher, in the target ontology. Another example is the use of agregate functions . An ontology Os might have a concept Parent with a property hasChild, whereas the ontology Ot might also have a class Parent, but in this case only with the property nrOfChildren. An aggregate function is required to count the number of children in Os in order to come with a suitable property filler for nrOfChildren. A valuetransformation is a simple transformation from one value into another. An example of such a value transformation is the transformation from kilograms into pounds. An example of a transformation, which requires both a structural and two value transformations is the transformation from a full name to separate first and last names. Splitting the full name into both the first and the last names requires structural transformation. After the structural transformation, two value transformation are required; one for the first and one for the last name. Query Rewriting and ontology merging A query addressed to an ontology Os has to be rewritten in terms of the ontology Ot in order to get results both from Os ant Ot. This use case indicate the need for the ontology mapping to not only map instances of the ontology but also map concepts and relations in the source and target ontologies. This is necessary for the case when a query written in terms of an ontology Os must be executed on an instance base, which is described by Ot. The mapping needs to specify exactly how concepts and relations in Os relate to concepts and relations in Ot in order to enable the rewriting. The mapping language is then required to provide the possibility of expressing the correspondences between the concepts and relations of the two ontologies. Versionning support The ontology mapping language must support constructs for the versionning of the mapping and for reffering to specific versions of the source and target ontologies. As this task is concerning the Versionning module of DOME we refer you to the Versionning working drafts D6.X here. Treating classes as instances Different ontologies might be modeled within slightly different domains with different granularity. What is seen as aclass in one ontology might be seen as an instance of another class in another ontology. In order to support inter-operation between two ontologies with such differences, class need to be mappped to instances and vice-versa. In a more general way, the mapping language should support mapping of any entity in the source ontology to any entity in the target ontology. For example it should be possible to have a relation instance mapping, a class-relation mapping, etc. Mappings of different cardinalities It might be necessary to map a class in one ontology to a number of different classes in the other ontology. It might also be necessary to map a class in one ontology to a class and a relation in the other ontology. In other words, the language needs to support mappings of arbitrary cardinalities. Conditionnal mappings In some cases the mapping relation between an entity of the source ontology and another entity of the target ontology may apply only if certain conditions are satisfied. For example the concept human in the source ontology is mapped to the concept man in the target ontology only if the attribute gender of the concept human is equal to male. This conditional mapping should be expressed in the mapping language. Patterns are templates that match the more usual mismatches between two ontologies. The use of predefined patterns is expected to considerably reduce the mapping designer task. These patterns should be expressed in the mapping language, they may be seen as building blocks for this language. A pattern is instanciated for a particular pair of ontologies into an ontology mapping, a complex mapping pattern is composed of other (elementary or complex mapping patterns) and a mapping is composed of a number of instanciated mapping patterns. The ontology mapping language must supports the use of elementary patterns as constructs of the language itself. An elementary pattern specifies the relation between one or more ontology constructs of the source ontology and one or more ontology constructs of the target ontology. The mapping pattern describes both the relation and the necessary instance transformation in a declarative way. When the mapping pattern is instanciated to a mapping relation, the abstract ontology constructs in the patterns are filled-in with the actual ontology constructs from the source and target ontologies. The relation and the transformation can be further refined. An additionnal benefit that these mapping patterns could bring is when mapping patterns would be associatedd with similarity detection methods. A Match operator could then detect mapping patterns based on certain similarities between the different ontologies. Mapping between two ontologies consists in relating the corresponding entities from one ontology to the other. The abstract mapping language (section 3.1) gives a format to express the complex relation that may stand between these entities. The user of the DOME mapping tool should have the possibility of creating mappings by directly entering constructs of the language, eventually using patterns. For ergonomy the DOME mapping tool should also include a graphical interface for this task. A ontology mapping graphical interface is commonly constituted of two representations of the ontology to be mapped (see for example [Noy and Musen 2003]). For more informations about the used representation of the ontology, see the ontology editing module of DOME, working drafts D8.X on this page. The user select the correspondent entities in the two ontologies to realize the mapping. When the relation standing between the two ontologies is complex, the user may select a convenient pattern and apply it to the mapping case. The large ontologies like Proton [Terziev et al 2005] or Wordnet [Fellbaum 1998] contain thousands of concepts and relations. It is obviously a complex and time consuming task to map two ontologies having these sizes, almost each concepts and relations in the source ontology having a correspondent that must be determined in the target ontology. In that scope, the assistance of automated method to (semi-)automatically find the correspondences between the entities of two ontologies would be very welcome. As already mentionned in section 2.2, the research on these methods is very dynamic and different algorithms are trying cope with this problem. There are different techniques used to automatically find mappings between ontology schemas. A good classification of these techniques is given in [Shvaiko 2004]. The techniques are classified in two categories: Element-level and Structure-Level. The former technique use the labels and descriptions of the ontological entities and compare them, eventually using some external tools to measure the distances between two elements from two ontologies. An exemple of a method element-level based method would be to compare the labels of the two ontologies pair by pair using a string comparizon method. The latter technique consists in analysing the structure of the ontological schema, by matching parts of the concept tree for example. These techniques are then returning similarity measures for the entities of two ontologies, these measures are then propose to the user which validates the effective mapping. The DOME mediation module will have an interface on which such automation algorithms may be plugged. This interface takes one or more algorithms as an entry together with the indication about which technique of the classification the algorithm is actually using. The algorithms may then be combined to cover the different techniques and compute better quality mappings, ideally fully automatized. The Vs indicate in which phase which requirement is being initially tackled. Here is the rough architecture diagram of the DOME mapping tool, including the required components presented in this document. The DOME mediation component requirements are positionning it as a top level of the ontology mapping tool. Ontology mediation is a key process that enable interoperability and communication between different semantic bubbles in the semantic web. The Ontology Management Working Group will spend considerable efforts to bring this module to a commercial use maturity as part of the DOME project.